Hey. So you want to know what SiegeStorm is, huh? Well, since you landed on this BGG profile, and not one of the other 95,474 game profiles, we might call it destiny and give it a shot, right? But first we’ll let this sink in…. Over NINETY FIVE THOUSAND games. Crazy. Each of them “unique”, “fresh” and “innovative”… Yeah, right. But don’t worry! SiegeStorm is totally different! No innovations here, friend. You got cards, your enemy got cards. You both cast some creatures and spells, then one of you win. BOOM! Yeah, it is pretty fun too! What do you mean this is not a good enough description…? Come on, this game costs like 10 USD or something, just buy it already…. No? All right, all right… Close your eyes. Imagine you are a mighty lord commanding an army. Or a magician summoning creatures onto a battlefield. Or a farmer who grows his units on a cornfield right in the storm of battle. Whatever works for you, man. 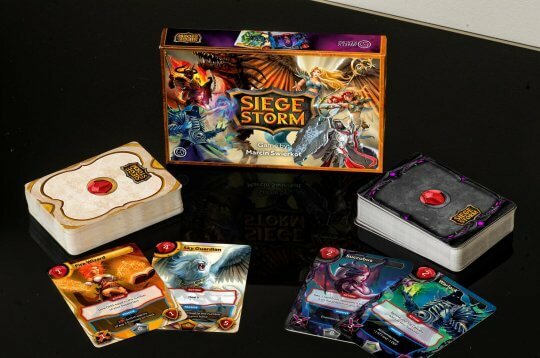 So you are building your army (yup, you guessed it, it is a deckbuilding game! ), choose your enemy and try to bring the pain to him, before he brings the pain to you. Between you and your enemy there are 2 tracks: one that your armies use to travel towards enemy, and a similar one where your enemy’s units travel to you. Again, just imagine whatever you want – two epic castles in a war or a slow, magic-fest between old, smelly wizards with rheumatism. Cards are everything here. No, seriously, they are everything: your life bar, your mana, your library and so on. When you draw them into your hand you can either play them or discard them to pay for some more expensive, fancy card’s cost. Ha! But there are even more decisions from here! So, you can build powerful combos, you can zombie-rush, you can build your economy and all sorts of other cool stuff. But whenever your enemy hits you, you will lose cards from your resources, so there is that. No cards to draw? You lose. Ok, long story short – the art is cool, the game is fun, and if you like it we might even get some expansions going pretty soon.